DuckDuckGo.com continues its strong growth thanks to blunders by Google and Facebook. 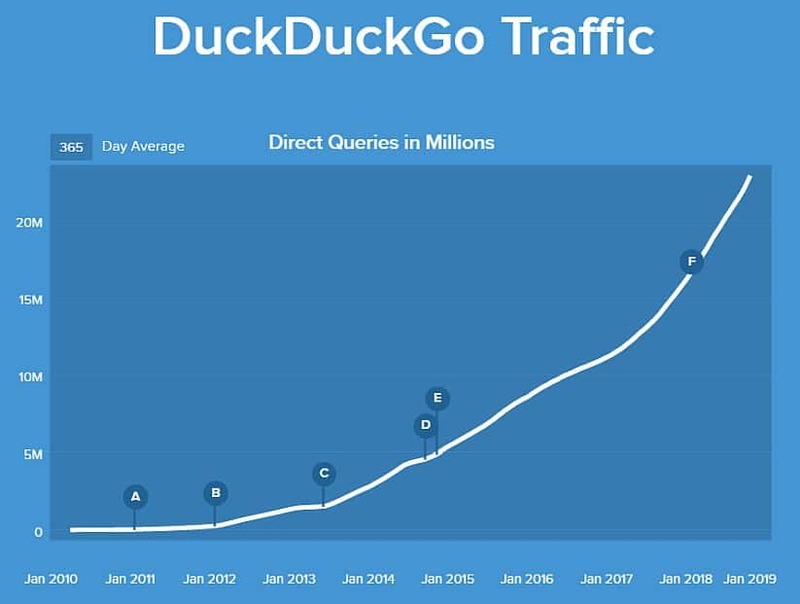 DuckDuckGo is growing and faster than ever before. Privacy-focused search engine DuckDuckGo is more popular than ever. The company recently announced that they’re now serving an impressive 30 million searches per day. DuckDuckGo allows users to search online without having their personal information tracked and shared, or cookies stored in their browser, something that search engines like Google are now notorious for. DuckDuckGo was founded back in 2008 but has seen its most rapid growth just over the past few years. According to a tweet made by the company, since 2015 they’ve gone from 10 million searches per day to 30 million. And the jump from 20 to 30 million took less than a year. 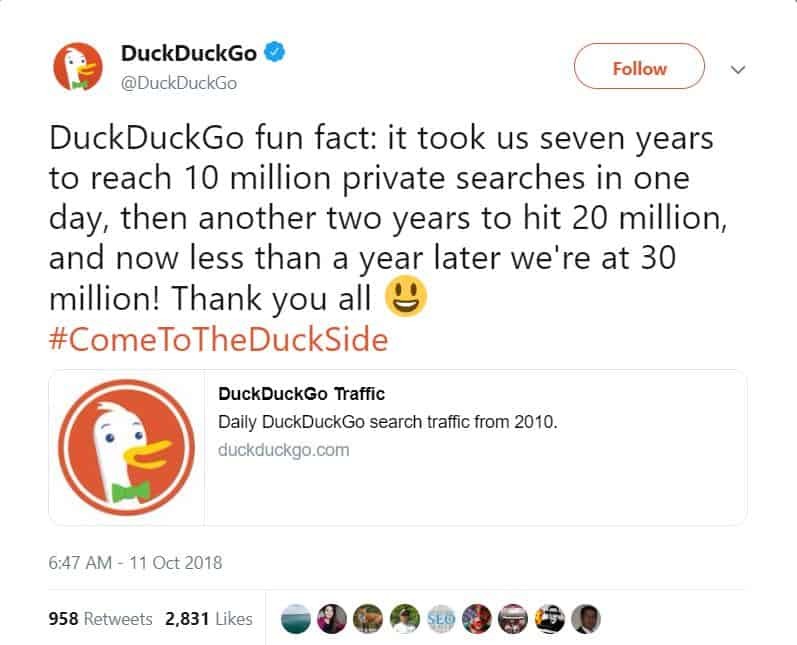 Congratulations on your milestone DuckDuckGo ! Of course, it’s not uncommon for a company to grow more quickly as it gains momentum and name recognition, but DuckDuckGo’s growing popularity also has a lot to do with the constant scandals surrounding big data companies like Google and Facebook. In July, it was revealed that Google gives many third-party app developers access to the content of your Gmail account. In August, the Associated Press reported that Google tracks your location when you open Google Maps, use certain Google-related apps on Android or iPhone, and even when you use Google’s search feature. Why is this a big deal? Because the location tracking continues even when you turn ‘off’ the Location History setting! And just earlier this month, Google axed its social media service, Google+, because of a security-bug that exposed users’ data for years and that Google later tried to cover up to avoid regulation. These continued data leaks and security breaches have not only made online privacy a mainstream issue among the public and lawmakers, it’s eroded trust in companies like Google. With that in mind, it’s not surprising that more and more of these same folks are using sites like DuckDuckGo and VPN software to protect their privacy and personal information.